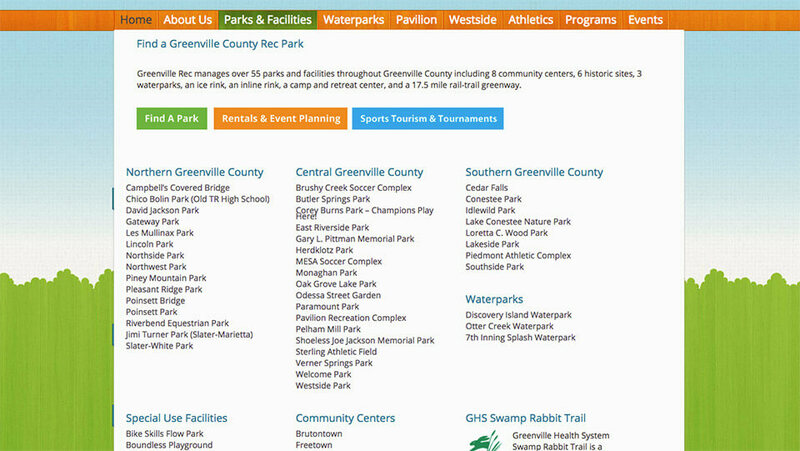 Greenville County Rec maintains 55+ state-of-the-art parks and facilities in Greenville County. Through partnerships with other government bodies and organizations, Greenville County Rec is also responsible for one of Greenville’s most popular assets: the GHS Swamp Rabbit Trail. 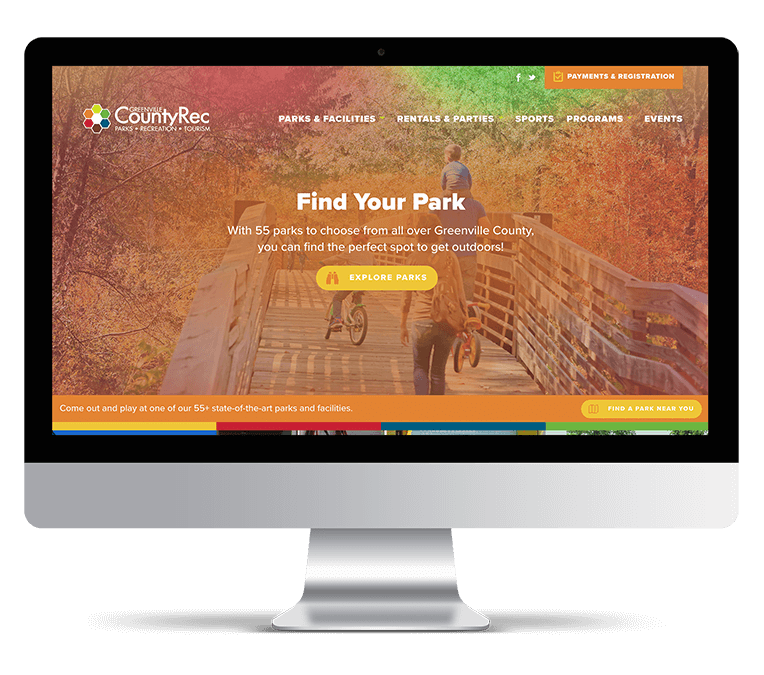 Prior to their website redesign, Greenville County Rec’s web presence did not encourage Greenville County residents to explore the many amenities that our county has to offer, nor did it make information easily accessible. 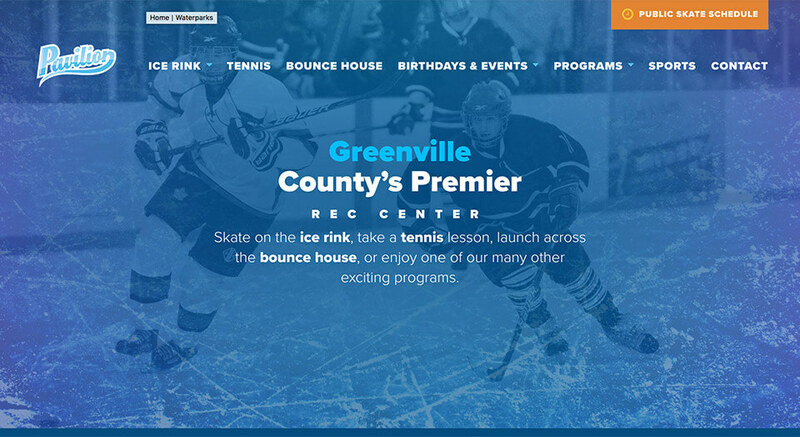 Greenville County Rec sought a web design agency to better organize the content on the site, create a more pleasant user experience, and validate the organization’s existing reputation with an interactive and highly visual finished product. 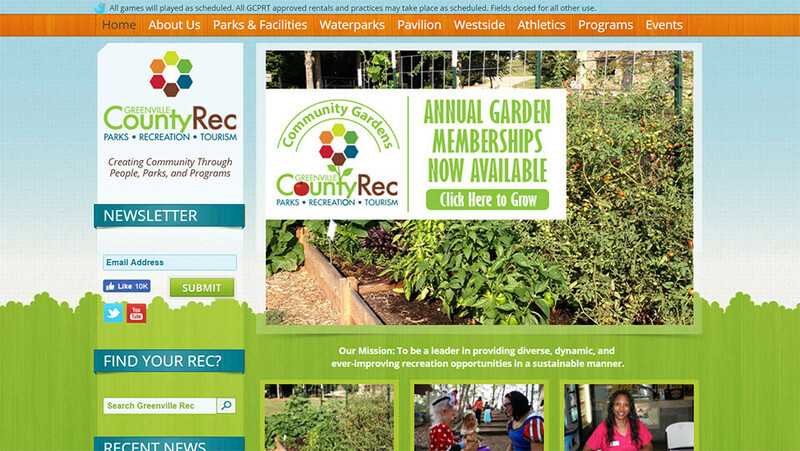 With accessibility being our priority, we knew we needed to simplify Greenville County Rec’s busy main navigation bar. The existing navigation bar housed information for all different facets of the organization, which was overwhelming for users. We knew that putting too much information on one website would lead to the same cluttered and cumbersome feel that the existing site had. 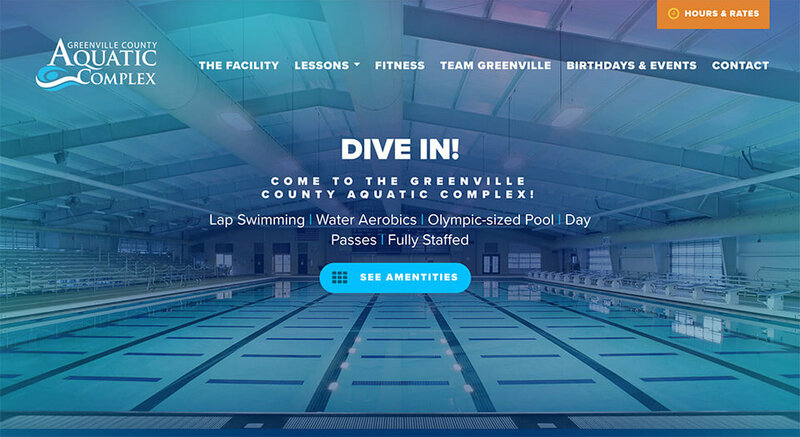 To make for a simplified user interface, we split the website into five distinct “sister” sites: the main site, a Greenville County Aquatics Complex site, a Pavilion site, a Sports Tourism site, and a Waterparks site. This strategy would allow users to more easily find the information they were seeking. The finished product was a collection of five websites that highlight Greenville County Rec’s diverse recreation options, validate the organization, and are easily updatable. 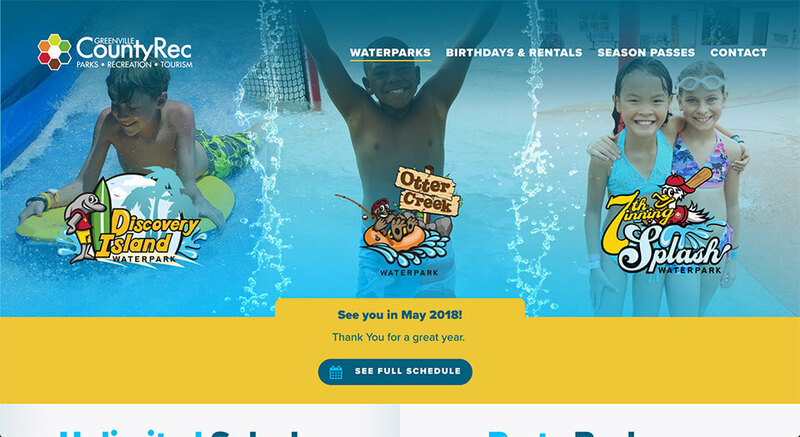 Greenville County Rec has received positive feedback about its new online presence—in fact, the World Waterpark Association awarded the organization the 2017 Wave Review Award for the Greenville County Waterparks site. Entries are judged based on originality, creativity, innovation, and overall excellence. From a design perspective, Greenville County Rec wanted its sites to appear personal, inclusive, and playful. To achieve this look, we paired high-quality photography with fun animation and illustrations throughout all of the websites. Each site feels unique, but they all share a common theme. Greenville County Rec also had specific functionality requirements. It was critical for their new website to integrate with Webtrac, their reservation and registration portal. The link to Webtrac is located in Greenville County Rec’s utility navigation so that users can easily access it. 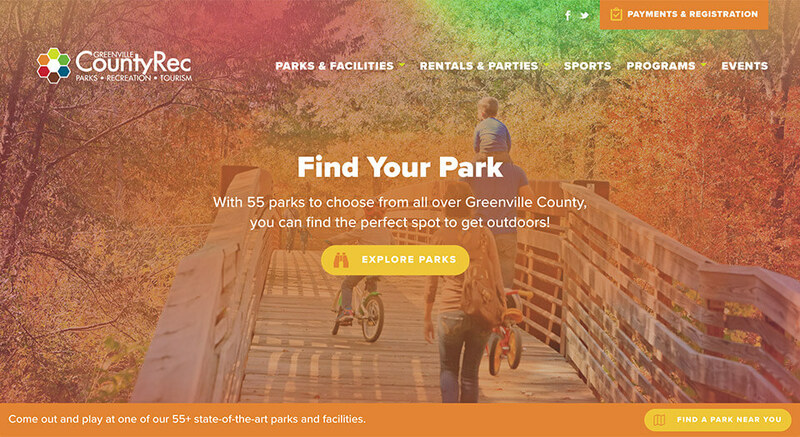 This link leads users off the main Greenville County Rec site, but the landing page is designed to mirror the rest of the site so as to offer a consistent user experience. With the finished product, we managed to convey a lighthearted look while maintaining the integrity of the organization. We made sure that all five websites were highly functional and that users could easily access all necessary content to explore everything Greenville County has to offer.